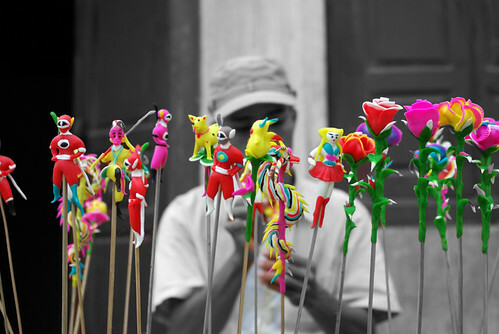 "To he" is a traditional toy for Vietnamesechildren made from glutinous rice powder and shaped into edible figurines. In the past, "to he" were made and sold only during festivals, especially Tet (lunar New Year) and the Full Moon Festival, both favorites of children..
To create a to he figurine, a crafts person needs a mixture of glutinous and ordinary rice powders that can be easily kneadedinto edible shapes, plus bamboo sticks for the to he and to use for graphics. Modeledby hand, the "to he" are often shaped like animals, flowers and characters in folk stories like “Ton Ngo Khong,” or the Monkey King from “Journey to the West”. The seven basic colours are green,sea blue, red, purple, yellow, white and black, now made from food dyes that areused to replace colours made from trees or ashes. "To he" making requires utmost patience,but almost all "to he" makers are men and there is an unwritten law in families of "to he" craftsmen that the to he secrets be passed from father to son and not to daughters.There are no lessons in to he-making and sons learn the skill from their fatherby watching. Today handicapped women and men study to he so that they can make aliving. Traditionally, "to he" artisans had acompact set of tools so that in just one day they could go to several communal spotslike markets, temples and especially local festivals where children often gatheredto play or accompanied their parents. Many generations of Vietnamese children have been overjoyed when their mothers return from market with a “to he”. Children can even eat “to he” after playing with them. Each Xuan La craftsman embarking on the “to he” trade learns to humour customers, especially children. The lesson of humanity is the first one every Xuan La villager bears in mind. "If we love people, they will surely come to us," “to he” makers say. Xuan La villagers take pride that, nowadays, “to he” makers can be found nationwide and even abroad in China, Laos, Cambodia and Thailand. This proves that the craft has not entirely disappeared. Although a “to he” is small, it embodies a lot of the sentiment, honour with Xuan La villagers.